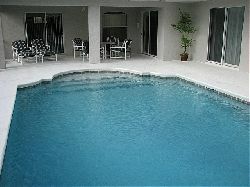 Welcome to Dream Stay Florida Villa which will be the heart of your dream vacation. Our Orlando vacation rental home is just 10 minutes from Disney�s main gate, yet maintains an air of peace and tranquillity. If you are looking for somewhere to spend your vacation that is spacious, luxurious and breathtaking then look no further. Our vacation home is maintained to the highest standards and you will be looked after by our manager who is very efficient, competent and on hand 24/7 should you require any assistance and most importantly only minutes away. Our Orlando vacation Villa is a luxury 4 bedroom vacation rental home (which is one of the largest 4 bedroom homes available), with the benefits of being fully air- conditioned our Florida holiday villa has 3 bathrooms, a family room, living room, nook, dining room, a fully equipped kitchen (including full size dishwasher), utility room with washer/dryer, games room, games console with games, computer with high speed broadband, free local and international phone calls and cable TV�s in every bedroom. The crowning glory of our Orlando vacation rental home is the large south facing, heated private pool with spa/hot tub in a screened enclosure. We provide luxurious and very comfortable pool/dining furniture, a large covered lanai means you may dine in comfort away from the glare of the sun, once you have dined relax on one of the many sun lounges before cooling off in your own refreshing pool or switch on the spa/hot tub, take a cool drink, climb in and let the bubbles soothe you. Our Orlando vacation rental home resides on the prestigious Orange Tree voted best Orlando vacation home 2006, surrounded by orange groves ( you can pick your own oranges) and with it�s own tennis and basketball courts, tots lots and conservation area. You are only minutes away from golf courses and Lake Louisa National Park � where you can try horse riding, snorkelling, windsurfing, fishing and many other activities. 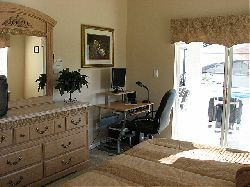 Communication and technology is a major part of today�s world and our Orlando vacation rental home offers free use of our computer boasting high speed broadband access, free local, national and international phone calls and a monitored security system which is linked to our manager who lives only 2 minutes away. You can keep in touch with other members of your party with our in house intercom system � so no shouting is required. We also have a games console with games. 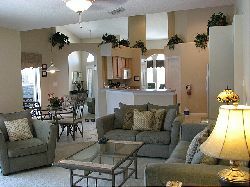 There really is something for everyone at our Florida holiday villa and everyone should be extremely happy. Whilst staying at our Orlando vacation rental home you will be sleeping on a king size bed (so big 2 of you will get lost � thank goodness for the intercom system) with private access to the pool area. You will have your own walk in closet, large ensuite bathroom with separate bath, walk in shower, his and hers vanity units and toilet room. Other members of your party will have use of a queen size bed with built in wardrobes and connected bathroom or 2 twin bedrooms which both have twin beds, built in wardrobes and share the third bathroom. 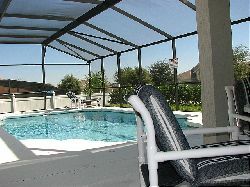 Our Orlando vacation rental home will appeal to guests of all ages. For our younger guests we provide free use of a travel cot, stroller, highchair, baby monitor, safety bed sides, car seat and pool toys. For added security we also have pool door alarms which can be switched off by adults and a removable pool safety fence. With easy access to Wal-mart and many restaurants � where you to dine in or perhaps decide to take out a meal which you can enjoy in our formal dining area, or why not make use of our fully equipped kitchen and rustle up something yourself. With take aways including pizza�s, burgers, fish & chips, Taco�s and your own BBQ (for which you can buy steaks, burgers or other delights at the local stores) you will be spoilt for choice at our Orlando vacation rental home. Our Orlando vacation rental home is strictly a non-smoking home and pets are not allowed.